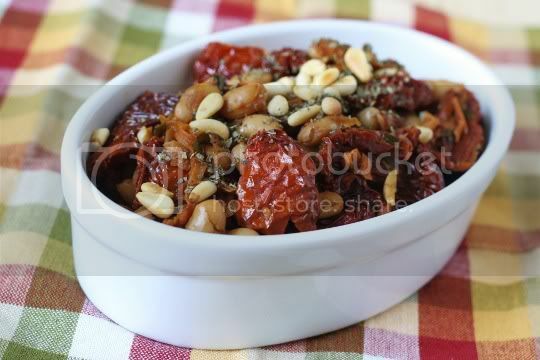 I wanted to use up a bag of dry-packed sun-dried tomatoes, so this recipe seemed like a sure winner. Unfortunately, it turned out to be something quite different from what I expected. 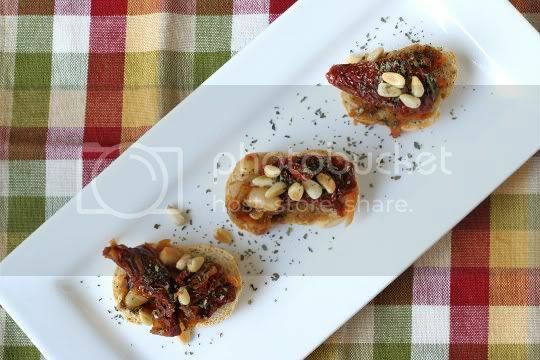 It wasn't a total disaster, but look elsewhere if you're looking for a true bruschetta recipe. For one thing, the recipe is way more complicated than it needs to be. Try to find pre-cut julienned sun-dried tomatoes, because there is no humanly possible way that you can cut them yourself. I thought I had a bright idea and attempted to use my food processor, but that resulted in a very scratched up bowl. Nice. So, I opted to use them whole. 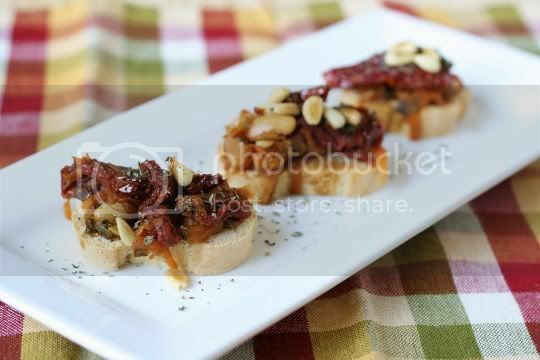 Toasted pine nuts aren't even included in the bruschetta mixture, they're used on top almost as a garnish. 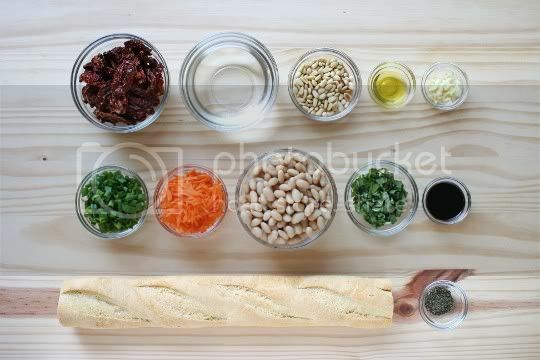 I ended up just mixing mine in at the end, since there's no way a mass of pine nuts and whole beans are going to fit on a baguette slice (more on that later). The actual cooking begins with sauteeing garlic, green onions, and carrots, then adding beans and soaked (and softened) tomatoes and their liquid. Next, fresh basil and balsamic vinegar are added, and the whole mixture is simmered for about 10 minutes. I chose not to toast the bread under the broiler, as I thought this was just an extra step that I didn't feel like dealing with at that point. I do think it's necessary, however, as the toasted version ends up being a much sturdier base for the heavy topping. But once the toast is topped, you have to broil it AGAIN! I mean, it's getting a little ridiculous at this point for an appetizer, right? As for the actual bruschetta, it really didn't fly with me. I'd much prefer a raw tomato-basil bruschetta, like the traditional kind found in restaurants. It was way too heavy and hearty to top bread. But on the bright side, this dish works quite well as a side dish. 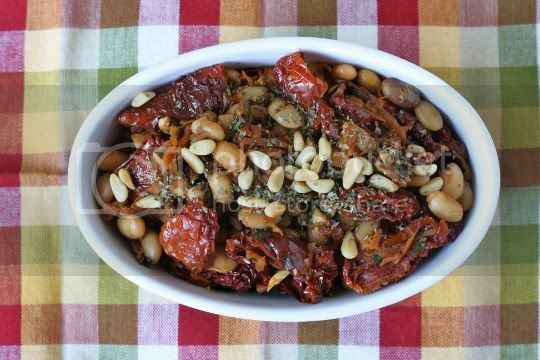 The flavors work well together: the tangy tomatoes are definitely the highlight of the dish, the garlic and onion adds a nice pungence, and there isn't a lot of additional seasoning that's needed. I really disliked the beans when used on the bread, as it added a really unappetizing pasty texture...but in a side dish? It works. Try combining this with some kale sauteed with lots of garlic and red pepper flakes, along with a piece of bread (on the side) to sop up the yummy juices. Make again? As a bruschetta, no. As a side dish, possibly.